(And no, I will never shut up about them.) Did you see Milk? First, the movie is fantastic. I'll just get that out of the way. 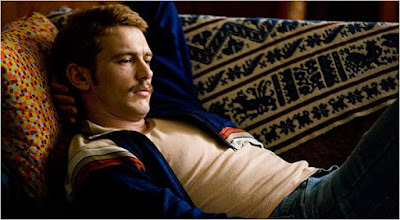 Second, hello James Franco. Why didn't I ever notice you before? Oh, because you didn't have a mustache. i saw this! (the article with the 'stache i mean, not the movie... yet). love. welcome back. hope you had a nice visit with NYC. No! I was going nuts in the theater until I remembered Spiderman. I will check out The Company - I love Robert Altman. Milk maids like milk mustaches.